Facebook now isn’t even being subtle about its intentions to turn Messenger into a tool to let people communicate with businesses. A new Facebook update positions a “Businesses For You” section right into the chat bar on desktop. This follows a recent update in which people who own Facebook pages found the pages’ chat icons available right on top of the chat bar. The upshot of these two updates is that on Facebook’s chat bar, once used to communicate with friends, now exclusively contains business contacts. It’s not clear how these business contacts were chosen to appear in the list, but a cursory glace shows that these were pages that users had visited in the past. They appear in a horizontal scroll-able menu in sets of three, and as far as we can tell, are pretty much an unending list. Facebook’s push towards business contacts on Messenger isn’t new. During last year’s F8 conference, CEO Mark Zuckerberg had talked about how chatbots would become the future of the Messenger product. He’d talked about his vision where users would be able to communicate with businesses straight from Messnenger, and had even demonstrated a chatbot which allowed users to buy flowers without ever leaving Facebook. Chatbots, however, hadn’t quite taken off. Several businesses had built chatbots of their own, but hardly any gained any notable traction. Some news chatbots provided news updates, and others provided live sports scores, but, by and large, they weren’t quite the disruptive force Facebook had envisioned. Which makes Facebook’s latest attempt to give chatbots even higher prominence sort of surprising. Facebook’s Timeline is some of the most valuable digital real estate available online, and to devote nearly almost all of the chat messenger to business contacts is a bold move. Facebook as a company seems to believe that business chat is the future: its subsidiary WhatsApp recently created verified business profiles to let users talk directly to business. Facebook, too, seems to sense that business chat might be the next frontier. It’s already connected most of the human beings on the planet, and connecting these 1.3 billion people to business might be the next, more lucrative, step. But in spite of the greater prominence, Facebook’s chatbots today appear to be plagued by many of the problems of the chatbots of a year ago. 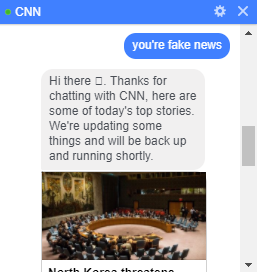 We tried out the CNN bot — we sent over a Hi, and the bot responded by saying that it would give us the top news stories of the day, and linked a story about North Korea. So far so good, so we sent over a Hi again. It responded with the same story. We tried throwing different things at the bot, but it resolutely sent us the same story back each time. BBC’s chat begins with a disclaimer saying that not every message sent to it will be replied to, and directs people to a url in case they want to share something with the BBC. This sort of negates the whole point of having a chat, but the BBC invited us to try out their chat bot on BBC Politics. 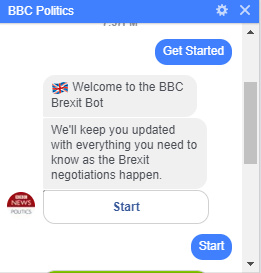 The BBC Politics bot told us it would keep us updated as the Brexit negotiations happen. These are still early days for bots, and some of them are certainly a little rough around the edges. But Facebook seems resolute in its mission to make them a part of its social network. And at this point, Facebook has the clout to dictate how technology will develop. And by placing bots right on people’s messengers, Facebook has sent out a signal that it still believes that chatbots are the future.